Community is front-and-center at this year’s Neuroscience Day, with many opportunities for all participants to share knowledge and expertise around brain health and research. The morning poster session highlights number of community information tables representing many members of the New Mexico Brain Network (NMBN), and other organizations. This provided an important opportunity for UNM researchers, clinicians, students, staff, and community attendees to learn about these important resources in New Mexico. Also in the morning, many attendees participate in one of two gentle yoga sessions to experience this LoveYourBrain Foundation-funded project provided through Hot or Not Yoga NM in Albuquerque. 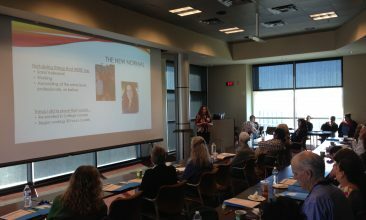 “Our team has an absolutely stimulating time learning about the groundbreaking neuroscience research being done here at UNM, meeting people in the TBI community who can benefit from our gentle yoga and meditation program, offering chair yoga to a room full of beautiful souls, and sharing resources with many of the other essential organizations who do great work in the brain and behavioral health communities in New Mexico. The collection of participants, speakers, and attendees was an invigorating reminder of just how many amazing people living in our beautiful state have dedicated so much of themselves to helping everyone live better lives.” Marisol Enriquez, owner, Hot or Not Yoga NM. After lunch, representatives from the NMBN each speak about legislative, programmatic, service provision and educational successes in improving brain health for New Mexicans during the last year. The day concludes with a professionally facilitated conversation about a New Mexico Brain Injury System of Care. The New Mexico Governor’s Commission on Disability Brain Injury Advisory Council sponsored the event with logistical support from BBHI.